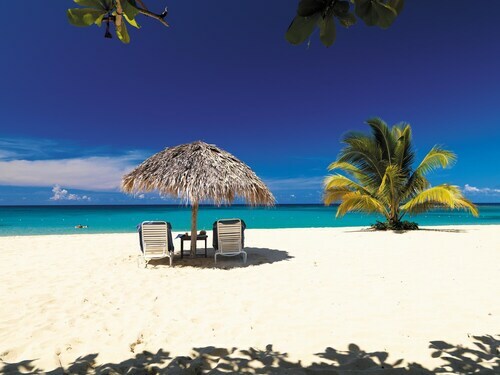 Get instant savings by booking an Ocho Rios travel package. Just select your favorite options and let Expedia take care of the rest. Savvy travelers who purchase a package deal on Expedia will save up to C$590*. With more than 400 partner airlines and 321,000 properties to choose from on our universal database, you won't have any difficulty creating your ideal vacation. Itinerary need some work? 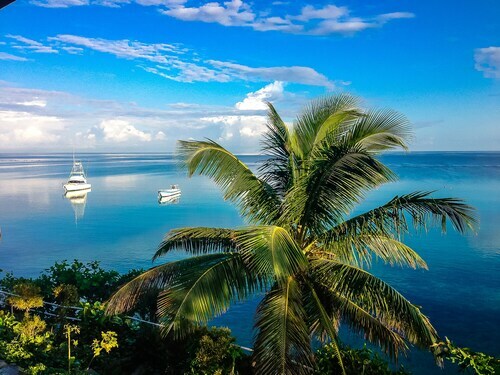 Ocho Rios vacation all booked but not sure what to do when you arrive? Let us make it simple. If you only had one day in Ocho Rios, you'd want to spend it at Dunn's River Falls. An iconic attraction that you won't soon forget, it lures crowds of tourists from across the globe. This city is full of surprises just waiting to be found. Dust off your selfie stick and take some great snaps at Turtle Beach and Dolphin Cove. Shopaholics rejoice — you'll be able to treat yourself to a little retail therapy at Island Village. Ready to exercise your wallet and buy up a storm? Travelers in this destination have heaps of options. Inhale lungfuls of the fresh, salty air and see colorful seabirds hover overhead at Mahogany Beach. A few hours spent near water will brighten up your day. Still have time to spare? Bring a picnic rug, find a shady grassy spot and enjoy the fresh garden air at Shaw Park Botanical Gardens. Traveling is about so much more than just visiting different places. It's all about the adventures you can have while you're away! To view a complete list of activities, jump onto our Ocho Rios things to do page. While Ocho Rios does have 39 properties to select from, it's always better to secure a room beforehand. Not quite sure where to start? Expedia is here to help with your next cheap vacation or luxury getaway. 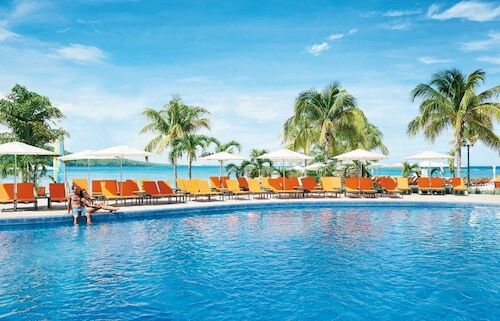 If you enjoy the high life every so often, why not treat yourself to a night at the Sandals Royal Plantation All Inclusive (Main Street) or the Moon Palace Jamaica - All Inclusive (Main Street)? If you'd rather spend your precious dollars on things such as exciting adventures and wild nights out, why not look into some of our budget options? 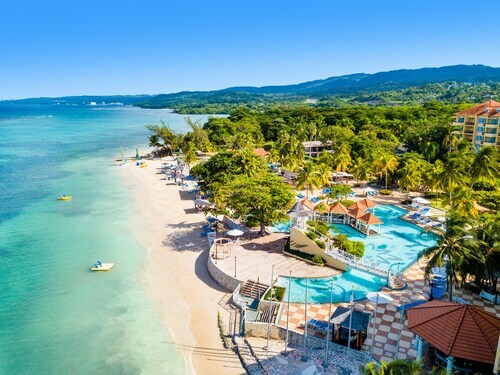 The Sandcastles Jamaica Beach Resort Ocho Rios (1 Main Street) and the Pineapple Court Hotel (Pineapple Place) are a couple of recommended ones. The airport is rarely the highlight of your vacation, but there's nothing like the thrill of knowing that your well-deserved trip to Ocho Rios is a mere plane ride away! Once the wheels hit the tarmac at Norman Manley International Airport (KIN), you'll be 40 miles (64 km) from the middle of town. Located in Ocho Rios, this beachfront hotel is in a regional park and within 1 mi (2 km) of Ocho Rios Craft Park, Turtle Beach, and Mahogany Beach. Dolphin Cove and Dunn's River Falls are also within 3 mi (5 km). 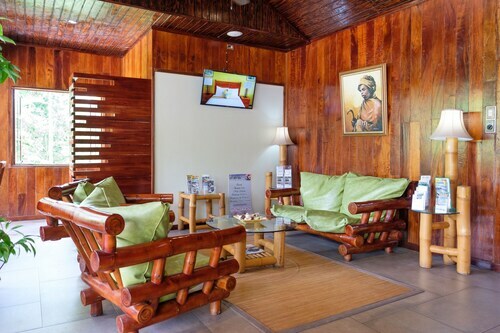 Set back 100m (109 yds) from Ocho Rios' teeming main street, this hotel serves as a tranquil retreat within walking distance of shopping, dining, and entertainment. 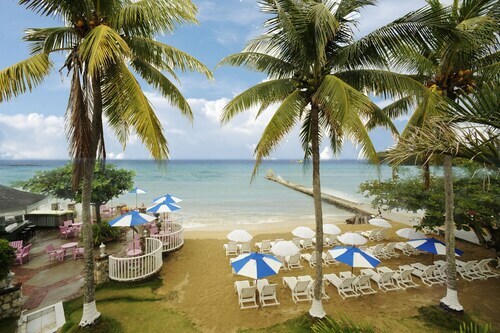 Located in Ocho Rios, this beachfront hotel is connected to a shopping center, just steps from Ocho Rios Craft Park and Turtle Beach. Dolphin Cove and Dunn's River Falls are also within 3 mi (5 km). Located in the heart of Ocho Rios, this hotel is within a 10-minute walk of Mahogany Beach and Turtle Beach. Dolphin Cove and Dunn's River Falls are also within 3 mi (5 km). Arrayed along 3,000 feet of private beach on Cutlass Bay, this hotel sits within a 22 acre tropical estate. Downtown Ocho Rios is 3 km (2 mi) away; Dunn's River Falls is 8 km (5 mi) away. 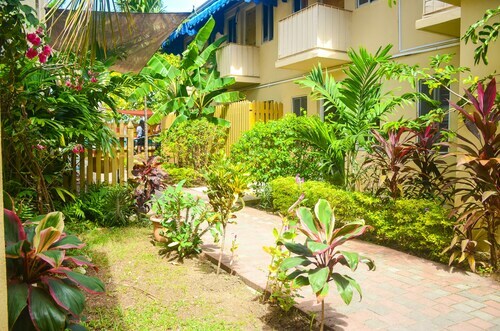 Located in the heart of Ocho Rios, this hostel is steps from Turtle Beach and Turtle River Park. Island Village and Mahogany Beach are also within 1 mi (2 km). Situated in Ocho Rios, this luxury resort is 0.5 mi (0.7 km) from Coconut Grove Shopping Village and within 3 mi (5 km) of Mahogany Beach and Turtle Beach. White River Reggae Park and Prospect Plantation are also within 1 mi (2 km). Tue., 18 Feb. - Wed., 19 Feb.